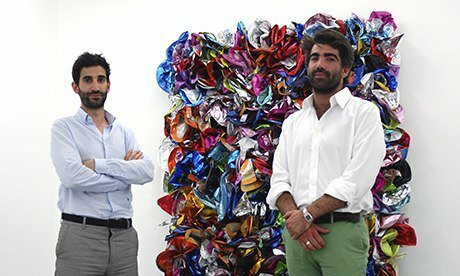 Arts head: Jeremy Epstein and Charlie Fellowes, founders, Edel Assanti. Tips for aspiring gallerists? Programme, programme, programme, say Jeremy Epstein and Charlie Fellowes, founders of Edel Assanti. Photograph: Edel Assanti. Guardian Professional, Tuesday 5 November 2013. Hi Jeremy and Charlie - can you tell me a bit about Edel Assanti gallery? Edel Assanti presents work by artists who are simultaneously forward-thinking and conscious of their place in a broader art historical context. We are drawn to concept-driven work, where technical approaches endorse the ideas behind the work itself. It's no mean feat, starting up a gallery in one of the worst financial climates in almost a century - what's the secret? From our point of view, the general principles and aspirations behind our gallery are the same that have successfully driven galleries for the past 50 years: creating and maintaining an engaging programme, supporting radical and innovative artists and creating a platform to keep them inspired and to maximise their vision. There must have been some serious hurdles along the way - what have been your biggest challenges so far? Our biggest challenge was navigating Edel Assanti's initial growth phases, from a pop-up initiative to a project space and finally to a fully functional gallery, while simultaneously each having full-time jobs at other galleries. How have you overcome them? Persistence and hard work. After almost three years of juggling the two commitments, we have both been full time at Edel Assanti for a year. Marcus Field said in the Independent that you represent a new breed of gallerist - do you see yourselves as different in any way? Marcus was referring to the fact that a young generation of dealers and gallerists - the focus of his article - had started their careers aspiring to work in this profession. Conversely, the majority of the past generation of art dealers had found their career paths from mixed backgrounds, as opposed to undertaking 'apprenticeships'. His article highlighted the fact that the art market has seen unprecedented expansion in the past decade. Although the methods, audience and forums have evolved, the basic gallery/artist model has, as far as we are concerned, remained essentially intact. The argument goes that art fairs are a challenge to the traditional gallery - do you see it that way? Fairs are a fantastic addition to the art world, as they give galleries the opportunity to reach new audiences and make institutional connections that were previously harder to establish. The gallery is still the primary platform for artists, as they provide the forum for experimentation and uncensored creativity; the gallery show is where the risks are taken! The fairs should not be viewed as a threat to the gallery model, rather a complementary channel. Understandably, some galleries will end up directing more energy towards their fair programme than their exhibition programme, but from our own experience, we would imagine that if there was too much of an imbalance, the gallery's artists would not feel their gallery was fulfilling its primary objective - putting on exhibitions of their work. What about collectors and shoppers? Are you attracting younger people with different buying habits through the door? We have been fortunate since the inception of the gallery to have the support of a group of young collectors who have followed our programme closely as it has developed. We still deal with many young collectors, which is particularly rewarding as they tend to be especially keen to learn about the work and the artists, and in doing so, they feel a sense of dedication to the artists' careers. Some people's attitudes have certainly changed - there can be a tendency to understand an artist in the context of their market, or even pursuing an artist for the sake of their market rather than a true passion for the work. That is an inevitable by-product of the market's expansion, and probably was not nearly as prevalent as little as 20 years ago. You started out doing pop-up shows - has the format had its day? Before opening our first permanent space, we worked in collaboration with Westminster Council on a series of pop-up exhibitions. Those early projects provided us with sufficient funding and experience to open a permanent gallery. The opportunities that were there when we started in 2009 are certainly not as readily available today, but the pop-up gallery model is a fantastic way for curators, dealers and artists to put on exhibitions without overburdening themselves with unmanageable financial obligations. It is the entry ticket for a lot of young people who have the energy and the will but not necessarily the means to open their own space. We hope it is here to stay! What are your thoughts on commercial giants like Amazon getting in on the art dealership game? In the immediate term, we don't think that there will be any radical changes to the way the marketplace currently functions at the top end. We would imagine that these platforms will prove most effective for lesser-known artists, as well as lower-end works and editions that stand to benefit from increased visibility. In its current incarnation, Amazon will not threaten the blue-chip gallery model in the way that it has impacted upon high street record stores, as the type of goods and consumers are completely different. That said, we think it's a question of when rather than if online sales platforms assume a decisive role in the future of the art world - in the present state of affairs we are lagging behind every other creative industry in our harnessing of the internet's potential. What three top tips would you give to some of the younger, budding talent out there hoping to get where you guys are? 3) Work hard and don't take no for an answer. Finally, what has the gallery got coming up we need to know about? We currently have an amazing installation by Marcin Dudek at the gallery. We are also very excited about 2014. In the summer Noemie Goudal's touring museum show opens at the New Art Gallery Walsall, followed by her exhibition at Edel Assanti in September. We are also focusing a lot on the US, and will be showing at the Armory in New York and at the Dallas Art Fair.